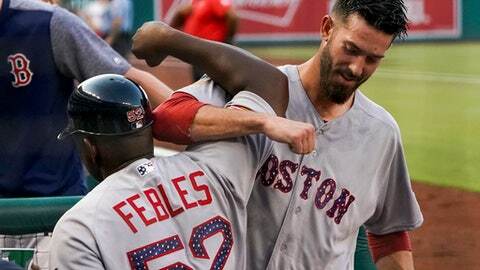 WASHINGTON (AP) Rick Porcello hit a three-run double off former teammate Max Scherzer and pitched six effective innings, leading the Boston Red Sox to a 4-3 victory over the Washington Nationals on Monday night. Porcello got his first career extra-base hit came in the second inning on a 0-2 pitch after the Nationals intentionally walked Jackie Bradley Jr. Porcello drove Scherzer’s 96-mph fastball over the head of Juan Soto in left center for his first RBIs since 2009. Scherzer and Porcello were teammates for five seasons with the Detroit Tigers. Porcello (10-3) allowed two runs and seven hits. Craig Kimbrel got four outs for his 25th save. Bryce Harper, Anthony Rendon and Daniel Murphy homered for the Nationals. Scherzer (10-5) struck out nine in six innings. NEW YORK (AP) – Ronald Acuna Jr. hit a two-run homer in the 11th inning that nicked the glove of a leaping Aaron Judge in right field, and the Braves beat the Yankees in a matchup of two of baseball’s best teams. Johan Camargo homered early and Jesse Biddle (2-0) pitched out of a late jam for the NL East leaders, who earned their fourth consecutive victory. A.J. Minter got three outs for his fourth save. Judge hit his 23rd homer for the Yankees (54-28), and second in two nights. David Robertson (5-3) got the loss. KANSAS CITY, Mo. (AP) – Francisco Lindor homered twice and drove in a career-high seven runs, powering Cleveland to the road win. Indians ace Corey Kluber (12-4), who failed to make it out of the second inning in his previous start at St. Louis, allowed three runs and seven hits in six innings. Lindor belted a grand slam in the fourth and a three-run shot in the sixth. Whit Merrifield homered on Kluber’s third pitch for his fourth career leadoff home run. Kansas City has lost 23 of their last 28 games. Royals right-hander Jakob Junis (5-10) was tagged for nine runs, eight earned, and eight hits in 5 1/3 innings. PHOENIX (AP) – Yadier Molina homered, Carlos Martinez pitched six effective innings and the Cardinals ended a four-game losing streak. Molina hit a two-run single in the Cardinals’ four-run first inning against Robbie Ray (3-1) and hit his 12th homer off the left-hander in the sixth. Martinez (5-4) allowed two runs and six hits. Bud Norris worked a perfect ninth for his 16th save. Paul Goldschmidt had four hits and an RBI for the Diamondbacks, who have lost four straight. DENVER (AP) – Kyle Freeland turned in another sizzling start at Coors Field and Colorado scored the go-ahead run in the seventh on a throwing error by shortstop Brandon Crawford. Freeland (8-6) settled in to go seven strong innings after surrendering a homer to Gorkys Hernandez on the first pitch of the game. It was Freeland’s 12th quality start of the season. Wade Davis worked his way around a one-out double by Buster Posey in the ninth for his 24th save. He struck out Crawford to end the game. San Francisco ace Madison Bumgarner (1-3) was charged with three runs, two earned, and seven hits in six-plus innings. MILWAUKEE (AP) – Brad Miller drew a bases-loaded walk in the 10th inning, sending Milwaukee to the win. Hernan Perez then bounced into a fielder’s choice before Miller’s walk ended the game. Corey Knebel (2-0) pitched a scoreless 10th for the Brewers, who trailed 5-1 after Robbie Grossman hit his first career grand slam in the fifth. MIAMI (AP) – Yadiel Rivera’s infield hit in the 10th inning scored Brian Anderson, lifting Miami to the victory. Anderson walked against Ryne Stanek (1-2) and took third on a single by J.T. Realmuto. Rivera, who entered as a defensive replacement in the ninth, then pulled a one-hopper up the line. Third baseman Matt Duffy backhanded the ball and double-clutched in foul territory before making a wild throw home, but the play was ruled a hit. Tampa Bay has lost 21 one-run games, most in the majors. Drew Rucinski (3-1) pitched a perfect 10th for the win. CINCINNATI (AP) – Alex Blandino’s double in the eighth inning completed Cincinnati’s four-run rally. TORONTO (AP) – Jose Iglesias hit a tiebreaking sacrifice fly in the 10th inning, and the Tigers earned their second straight victory following a season-long 11-game losing streak. Niko Goodrum tripled off Seunghwan Oh (4-3) with one out and scored the winning run when Iglesias followed with a fly ball to right. Jeimer Candelario had three hits for the Tigers, who won the season series against the Blue Jays for the first time since 2013. Joe Jimenez (4-1) got the win despite giving up the tying run in the ninth. Teoscar Hernandez had two hits for Toronto and drove in a run. Ryan Borucki allowed two runs and six hits in seven innings. LOS ANGELES (AP) – Matt Kemp tied a career high with five hits, Joc Pederson and Max Muncy hit back-to-back homers to highlight a six-run fourth inning, and Los Angeles routed Pittsburgh. Kemp hit a three-run homer in the sixth and drove in four runs for the second straight game. He came up a triple shy of hitting for the cycle. Kemp also scored four runs. Cody Bellinger homered in the third, leaving the Dodgers with 116 homers this season after they slugged a major league-leading and franchise record 55 in June. They already have five long balls two days into July. Alex Wood (5-5) allowed one run and six hits in six innings. Caleb Ferguson pitched three innings to earn his first major league save on his 22nd birthday. Nick Kingham (3-3) gave up seven runs – five earned – and eight hits in three-plus innings.